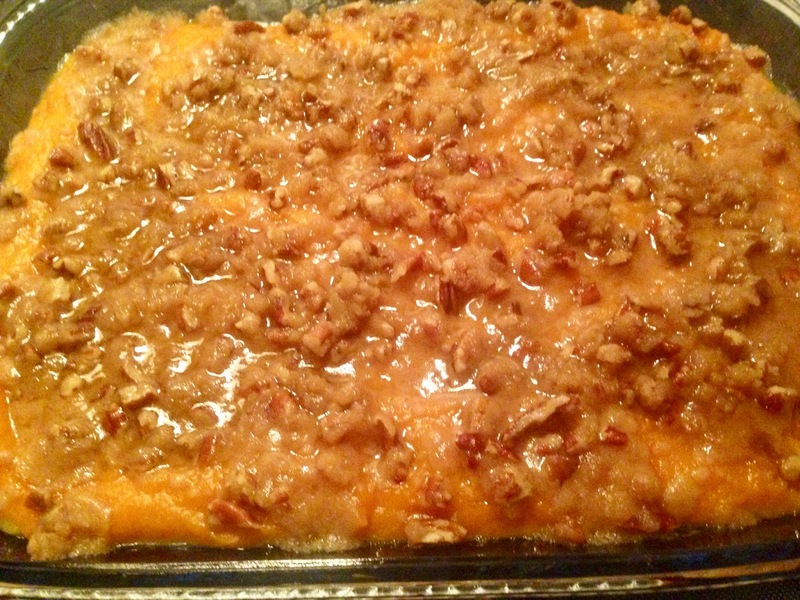 Amy's Creative Pursuits: Holiday Recipe Successes! I love to try new recipes that I found on the Internet. For Thanksgiving I tried two new recipes that were a huge hit and I wanted to share them with you because I think they will work great for Christmas too! My Thanksgiving meal turned out fabulous (if I do say so myself) but hands down the hit of the day was not the turkey, but the Sweet Potatoes! We loved this dish so much we couldn't stop talking about it! It has this delicious crunchy praline topping that you'd often find in a apple crisp or over ice cream. It was soooo good! My picture was taken before the topping hardened (things got crazy in the kitchen as I was doing all the last minute stuff that needs to be done getting the Thanksgiving food ready for the table that I forgot to take a final picture); but this is what it looked like during the baking process. Jason and Ashley (my son-in-law and daughter) are gluten-free so they ate the sweet potatoes as a dessert since they couldn't have any pie. This squash was literally the best I've ever tasted in my life! But please, go to the website and look at what the final product is suppose to look like, because mine fell flat! 🤣 The instructions say to be very careful not to cut all through the squash, but that's almost impossible when you get to the part where the seeds used to be. So because I accidentally cut through, the squash flattened there. However, that did not affect the taste. This was so good, I could not stop eating it. If you like squash, you need to try this recipe! My final dish I did not prepare for the holidays, but I made it awhile back. I think it would make a great dish if you plan on a having a romantic New Year's Eve dinner at home because the recipe serves two! I love to find recipes that only serve two because my husband and I are Empty Nester's. As if you can't tell by the picture because of all the melted cheese, (I mean, what DOESN'T taste good with melted cheese on top?) this dish was DELICIOUS! The cook who created this recipe said it "was better than restaurant quality" and they are absolutely right! I felt I died and went to heaven eating this and so will you! This is what it looked like cooking in the cast iron pan. 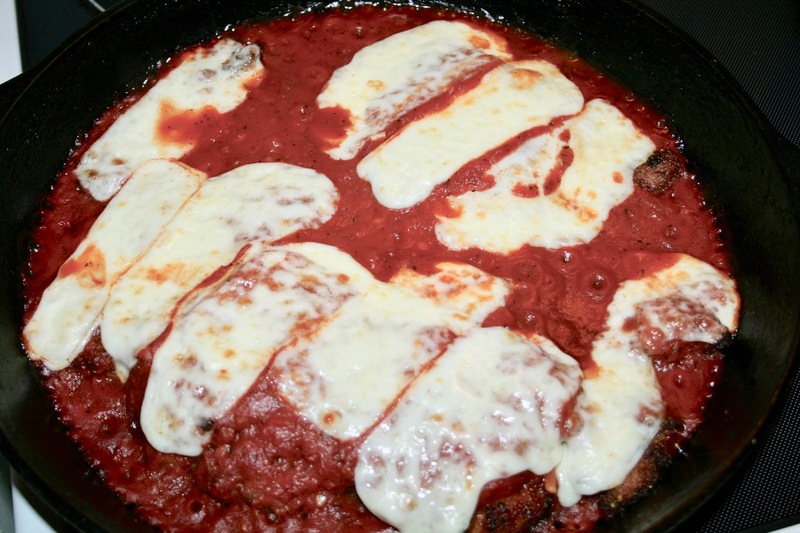 You can pot it under the broiler to town the cheese before serving too if you like! All the recipes can be found by clicking on the title of the recipe above the picture. They are not my recipes, I only tried and tested them, so I can not put them on my page. 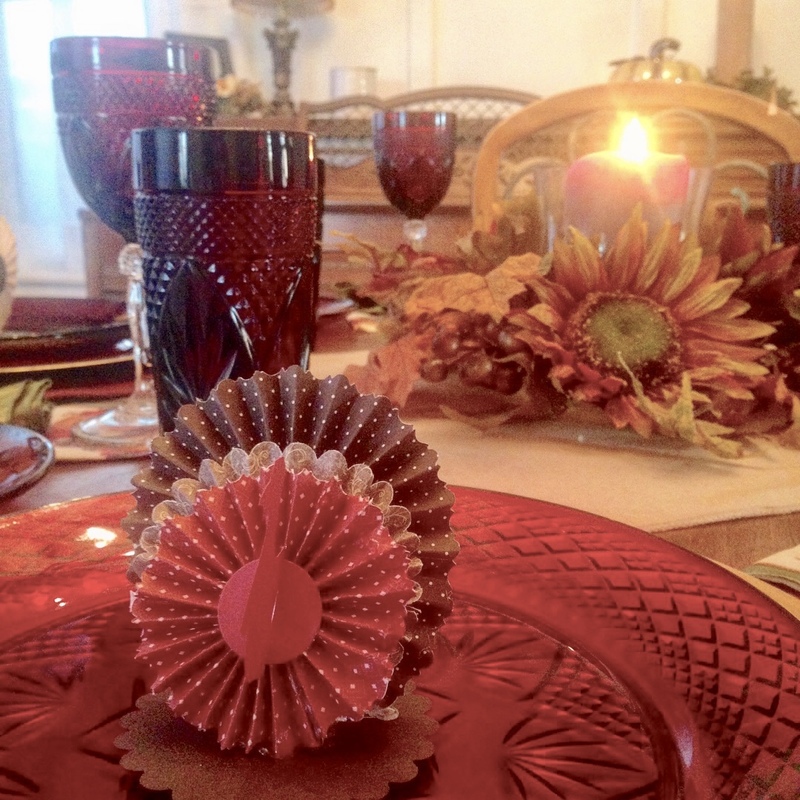 And finally, here are a couple of pictures of my Thanksgiving table. If you remember I made these paper turkeys to use as place settings for my Thanksgiving table. I promised you all a picture, and here it is! I loved how they turned out! So what about you? How did your Thanksgiving meal turn out? Did you try any new recipes, or did you make the same traditional family dishes. I'd love to hear from you! Oh, this recipe reminds me of the sweet potatoes my mom would make. I think the only difference may be the addition of coconut to her recipe. Pinning and drooling over here. And the other recipes sound delish, too. 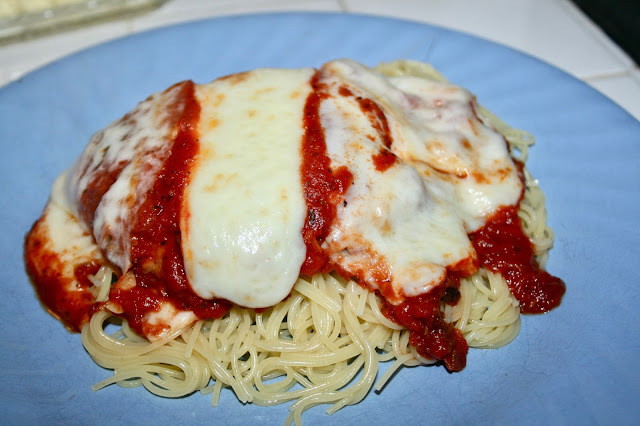 I have only made chicken Parmesan once and PC liked it. Need to fix it again with your recipe. Coconut on a sweet potato casserole...that's a new one to me. I haven't seen that ingredient added to a dish like this. I'm sure your hubby would love the chicken parmesan dish! I will have to try the sweet potato dish, although I am the only one that loves sweet potatoes in my house. But maybe they'll eat this dish. The squash looks delicious too and I'll have to try it as well. Italian type food isn't my favorite, but you make it sound really good, so who knows, I might have to give it a try too! Go ahead and make it, because my husband doesn't eat sweet potatoes either and even he tried it and thought it was good. And if no one does eat it but you, it doesn't matter because it doesn't make a huge amount. I could have eaten the whole dish myself within a week! LOL! 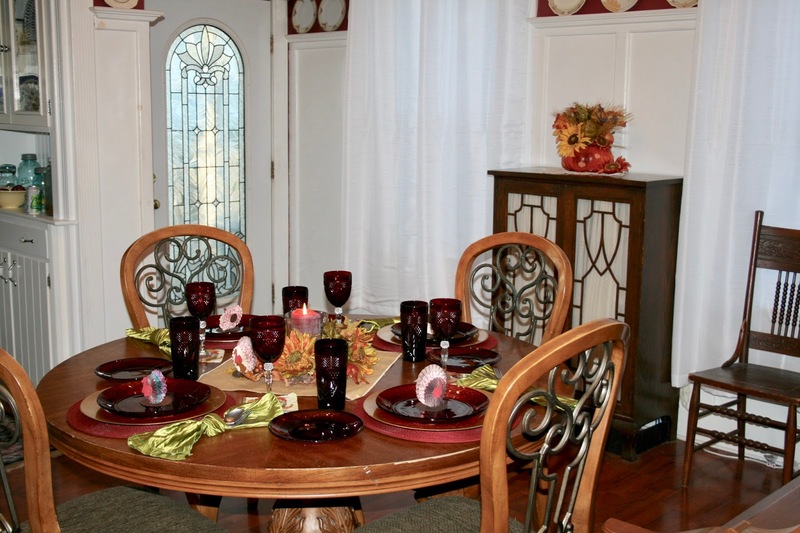 Oh, forgot to say, your table setting turned out really beautiful! Love the deep red glass ware, and how cute those turkeys look!